Apple's News+ service adds a pair of prestige newspapers, the LA Times and Wall Street Journal, to its new premium news app. During a special live event from the Steve Jobs Theater at their Cupertino campus, Apple took the wraps off its enhanced news subscription service, dubbed News+. 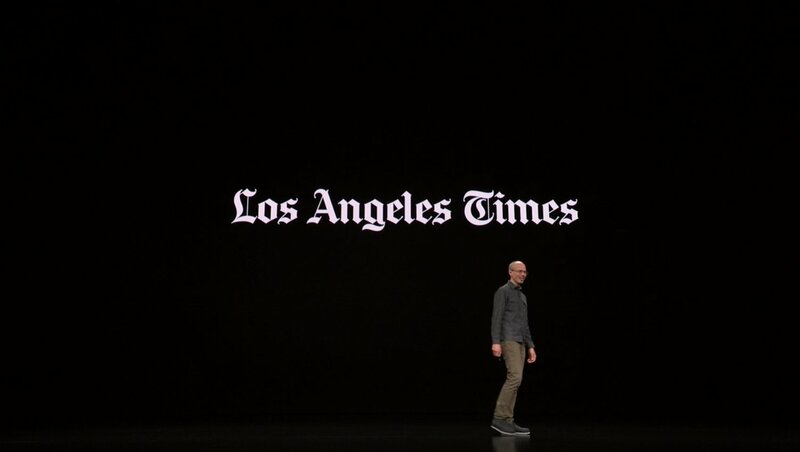 In addition to a wide variety of magazines and curated news coverage, Apple will offer digital access to both the Los Angeles Times and Wall Street Journal with the News+ service. The new premium subscription service will launch for $9.99 per month and Apple promises that users can feel secure using the service as advertisers will be unable to track them when using News+. Acccording to an internal memo obtained by The Verge, the Wall Street Journal portion of the News+ subcription will only contain "a specially curated collection of general interest news from The Wall Street Journal." It is believed that the business reporting and financial analysis that the newspaper is so valued for will not be included with the subscription. No word is available on what, if any, limitations will be placed on the Los Angeles Times portion of the subscription. The new News+ subscription service is one of several aggregate subscription services that Apple unveiled at their special event today. Apple TV+ was also announced as a new service that will offer Apple-exclusive TV programming from creators such as Oprah, Steven Spielberg, Reese Witherspoon, and more. Apple also announced a gaming subscription service for their devices known as Apple Arcade that will offer unlimited access to the newest mobile games and experiences. The birth of these Apple subscriptions points to a strong focus on recurring payment income for the tech giant moving forward as hardware sales are expected to slow. For more news from today’s Apple event, keep it tuned to Shacknews.